Making an altar is not a necessary part of Earthseed, but if you would like to make your own altar, this article may give you some ideas for how you might go about it. 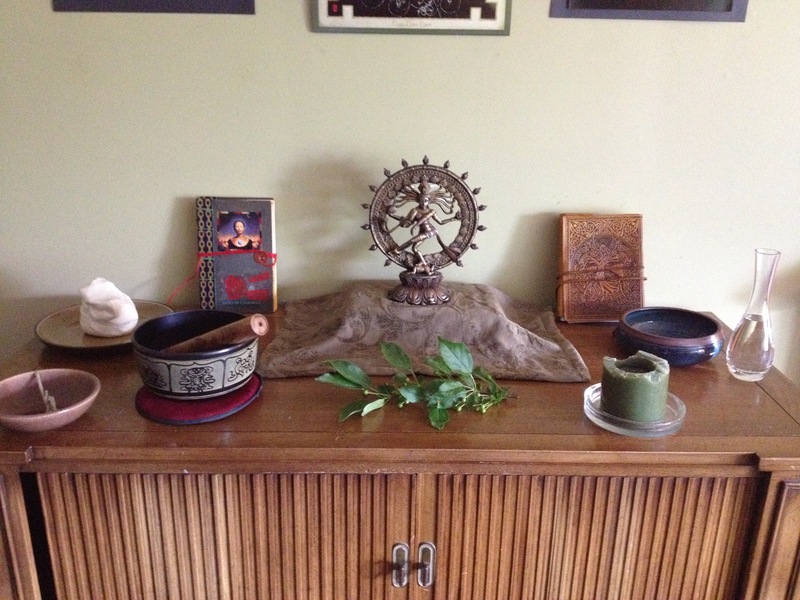 My altar used to consist of Neo-Pagan images. Recently, I deconstructed my altar to create an Earthseed altar, to correspond to the shift in my religious practice to focus on Earthseed. I wanted to share some pictures of my altar and talk about its elements. 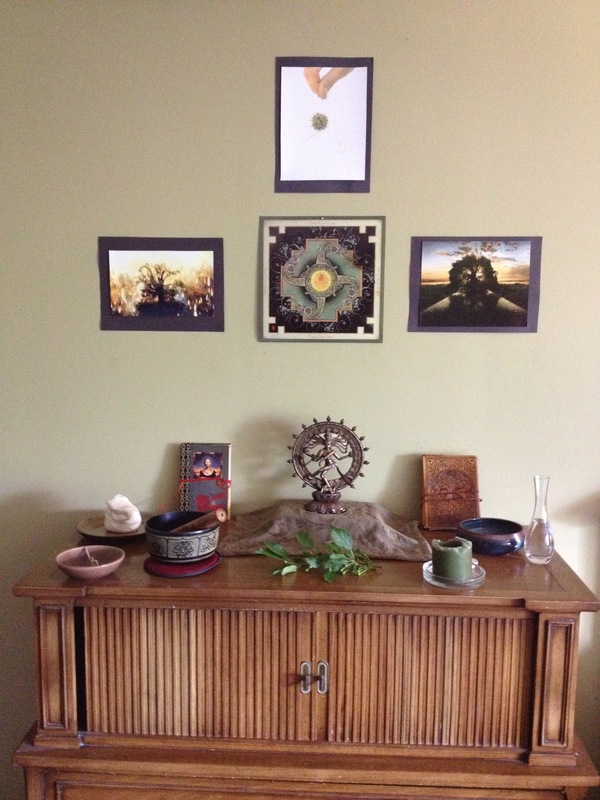 The altar was inspired by the Five Elements Ritual which I created using verses from the Book of the Living. This is a picture of the complete altar. The are (starting from the left and working counterclockwise), a block of clay, a bowl for incense, a singing bowl, a clipping of a bush from my yard (replaced periodically), a candle, a bowl, a small vase of water, a book with verses from the Book of the Living, a statute of Nataraja (the Hindu God Shiva in his form of the Cosmic Dancer), and a handmade journal by artist Monica Hand which I purchased at the Shaping Change conference recently. The Elements: The clay on the left represents the Platonic “element” of Earth and expresses God’s malleable nature. “God is Pliable … [God is] Clay” says the Book of the Living, “God exists to be shaped.” The incense and the singling bowl represent the “element” of Air. God is Change, and Change is all around us, like the air we breathe, even when we don’t see it. The candle on the right represents the “element” of Fire and expresses God’s destructive nature. Sometimes we are “Godʼs victim, Godʼs plaything, Godʼs prey.” The vessels of water represent the “element” of Water and God’s chaotic nature. “Chaos is God’s most dangerous face,” says the Book of the Living, “Amorphous, roiling, hungry.” The fifth “element” is the green clipping or else my own living body as I stand before the altar. I use these elements when I perform the Five Elements Ritual. 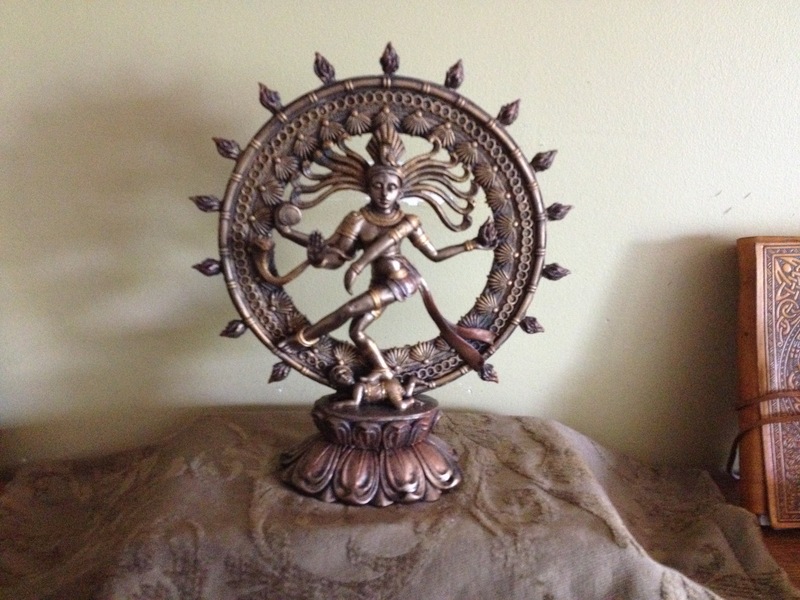 “The final image of Indian art is therefore not even that of the sage, the Buddha figure, but that of Shiva Nataraj, the dancer in time and space. Even if we should penetrate to the center of the temple, we cannot remain there. While life is in us, we must live in the world, where the Dance is, and to live truly, we must join the Dance. There is no reason for this. There is no reason for the world, only the rhyme and the rhythm of the days and nights and the four seasons, without us and within. Life is a Dance and the beginning and end of our lives are steps only; the Dance goes on with us and without us. In time and space, we, as all things, arise and dance and in due time slow and cease to be. But the Dance continues. The Dance is; it always is. According to the Book of the Living, we do not make images of God, but instead find images of God in the natural world around us. This is one place where my practice diverges from Octavia Butler’s Earthseed. I see images and icons as religious technologies, just like ritual and “god talk”, technologies which can be used non-theists as well as theists. Above the altar are four images. The central image is by Michael Green and can be found in his 2009 Celtic Blessings Calendar. It symbolizes Change and the Wheel of the Year. The other images are screenshots from the Darren Aronofsky’s movie, the Fountain. 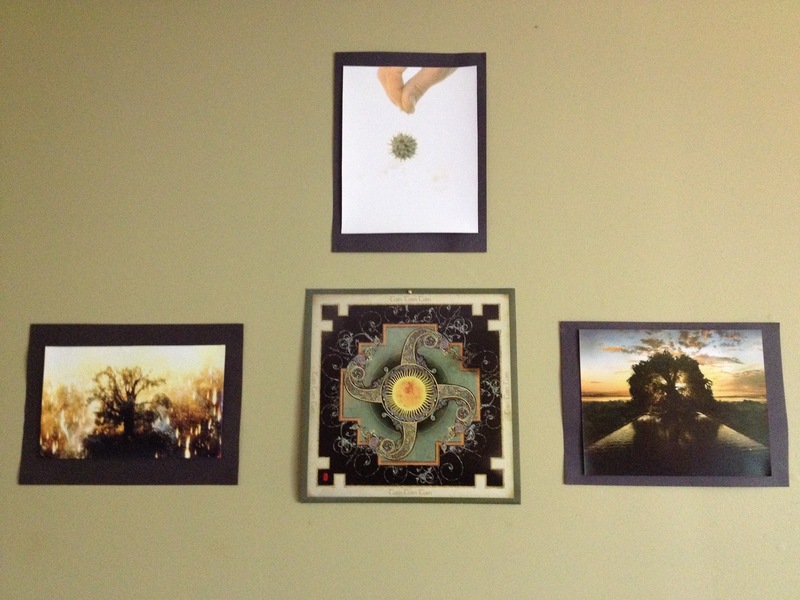 They show the life cycle of the Tree of Life and correspond to the Wheel image. Hey, that’s a very lovely space!